Sadly, almost everyone knows someone who has experienced a cardiac arrest. The next victim could be your co-worker, your neighbor, or a random stranger you pass on the street. In the state of Minnesota, cardiovascular events are currently the second leading cause of death, making them responsible for nearly 20 percent of in-state deaths. These statistics are sobering, but one small Minnesota city is taking impressive steps to tackle the problem head-on. 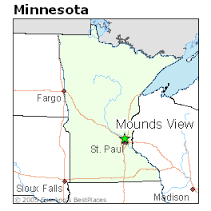 Mounds View, Minnesota, is a popular suburb in the Twin Cities metro area. More than 13,000 residents call Mounds View home, and the locale was named as an official Heart Safe Community in September 2016. Community leaders chose to participate in this initiative because it empowers members of the community through training and education. When a person’s heart stops suddenly as a result of cardiac arrest, immediate action is needed. The minutes between when first responders are called and when they arrive are vital. Survival is not likely unless action is taken right away, and death can occur within minutes after the heart stops. Most people want to be able to help in an emergency, but they don’t want to do anything wrong or they are just not quite sure how to proceed. That’s one of the reasons why CPR and AED training is so important. Some people feel wary about mouth-to-mouth resuscitation, so the Heart Safe program focuses on hands-only CPR. Studies conducted by the Journal of the American Medical Association have shown that bystanders are more likely to perform this type of CPR, and chest compressions perform the important task of trying to restore blood flow to the body. Public access to AEDs is another important part of this program. Since it received its Heart Safe designation, Mounds View now has an AED in every school. AEDs are also present in City Hall and other government facilities. The Heart Safe team continues to work to encourage more Mounds View businesses to have AEDs available to the public. As a result of the Mounds View Heart Safe movement, other nearby communities are joining the cause, too. Anoka County and Blaine are just two of the locations that are working toward their Heart Safe Community designation. When communities band together for awareness and training, lives can be saved. At In-Pulse CPR, we know that knowledge is power. Whether you live in Mounds View, Minnesota, or another part of the state, you have the power to potentially save a life. Check out /Minnesota to find a convenient class in your area.